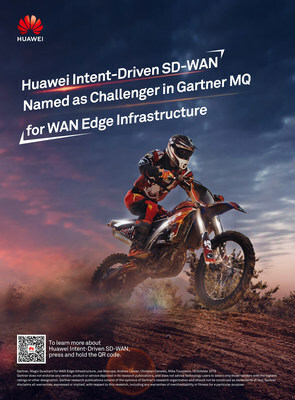 SHENZHEN, China, Nov. 8, 2018 /PRNewswire/ -- Huawei announced today that Gartner has positioned the company as a Challenger in Gartner's first Magic Quadrant for WAN Edge Infrastructure. Regarding global market share and industry influence, Gartner analysts selected the 20 vendors in the WAN Edge infrastructure field. They evaluated these vendors in terms of 'Completeness of Vision' and 'Ability to Execute'. Huawei's position as a Challenger during the first Magic Quadrant evaluation, which has a rather fierce competition, is due to the continuous and rapid growth of its global WAN edge infrastructure market share, and its leading SD-WAN Solution and products. "We are delighted that Huawei has been named as a Challenger in Gartner's first Magic Quadrant for WAN Edge Infrastructure," said Zhong Kaisheng, President of Huawei Switch & Enterprise Gateway Product Line. "We believe this is recognition of Huawei's SD-WAN Solution and testament to our long-term market strategy for and performance in providing customers with simplified, intelligent, and open enterprise interconnection networks. Many global carrier, enterprise, and MSP customers -- such as Japan's SoftBank Group, Norway's Broadnet, and China's Ping An Group and Fnetlink -- have chosen our SD-WAN Solution." Zhong Kaisheng continued, "Huawei's SD-WAN Solution accelerates service provisioning through automated deployment throughout the whole process, guarantees optimal cloud service experience through intelligent application optimization, and reduces O&M difficulty by leveraging AI-based intelligent O&M technology. This helps enterprises achieve on-demand multi-branch to multi-cloud interconnection and construct intent-driven interconnection networks. We launched our SD-WAN services at HUAWEI CONNECT 2018, so enterprises can quickly and conveniently obtain SD-WAN networking service capabilities in the same way they purchase cloud services." Cloudification of enterprise services requires innovative branch interconnection networks and WAN edge infrastructure. Huawei is now leading development in the SD-WAN industry and helping enterprise customers achieve business success. Huawei provides customers with a broad array of WAN edge functions, including routing, SD-WAN, and Next-Generation Firewall (NGFW). All of these functions can run on vCPE virtual computing platforms as software instances. They can also be centrally controlled with Huawei's Agile Controller, which enables automated service provisioning, flexible service chain orchestration, and intelligent O&M. Additionally, Huawei offers a full line of AR series routers and NGFW hardware devices. This can simplify WAN edge device sprawl, improve operational agility, and provide cost efficiencies. Moreover, Huawei's SD-WAN Solution has a proven capability in supporting large WAN deployments encompassing more than 1,000 sites. Huawei's flagship WAN edge offering -- the next-generation AR series routers -- provides a deep software and hardware portfolio, including software, hardware, and virtual computing platforms, and features the industry's widest variety of interfaces, including legacy T1/E1 and embedded LTE. At HUAWEI CONNECT 2018, Huawei rolled out its next-generation SD-WAN routers available in 16 models. These routers use a unified platform and converge extensive branch services, including SD-WAN, routing, voice, firewall, and Wi-Fi to simplify service deployment. Leveraging a unique hardware acceleration engine, they double the average forwarding performance than the industry. Additionally, they implement "three intelligences" -- intelligent application identification, application-based intelligent traffic steering, and intelligent application acceleration -- to simplify cloud-and-network interconnection for enterprises. Leveraging its differentiated advantages developed through technological innovation, Huawei has maintained a strong growth momentum in the WAN edge infrastructure market. To date, Huawei's AR series routers are already serving more than 20,000 enterprise customers in sectors such as government, finance, electric power, transportation, and manufacturing. For more information on Huawei's SD-WAN Solution and products, please visit: https://e.huawei.com/en/solutions/business-needs/enterprise-network/sd-wan.